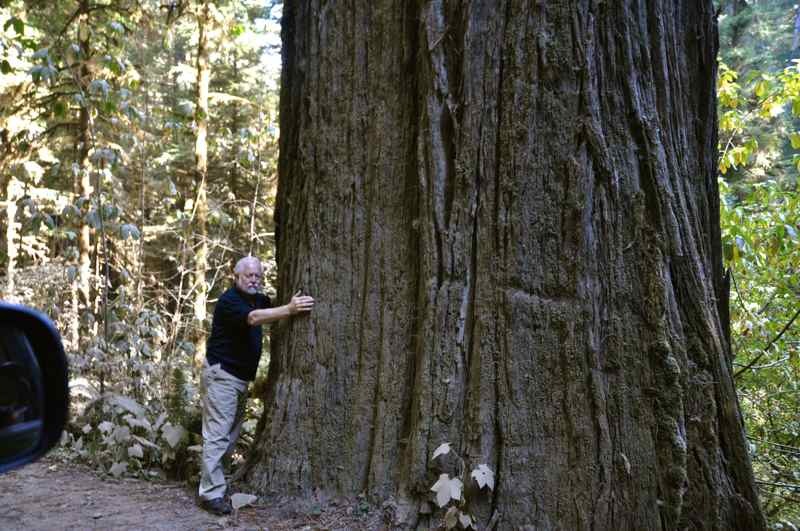 Husband Walter hugging a giant. We are back home after a nine-day fly-drive trip to the West Coast, Oct. 6-14. Well, actually, at this moment we are on a weekend jaunt to visit our Georgia kids and grands. But the West Coast memories are still bright. 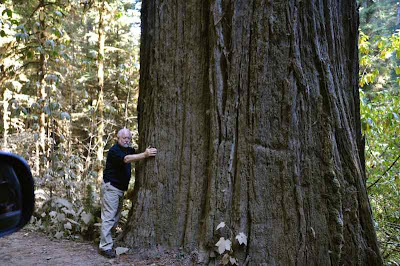 A highlight of that trip was visiting three of the world’s largest groves of giant redwoods. 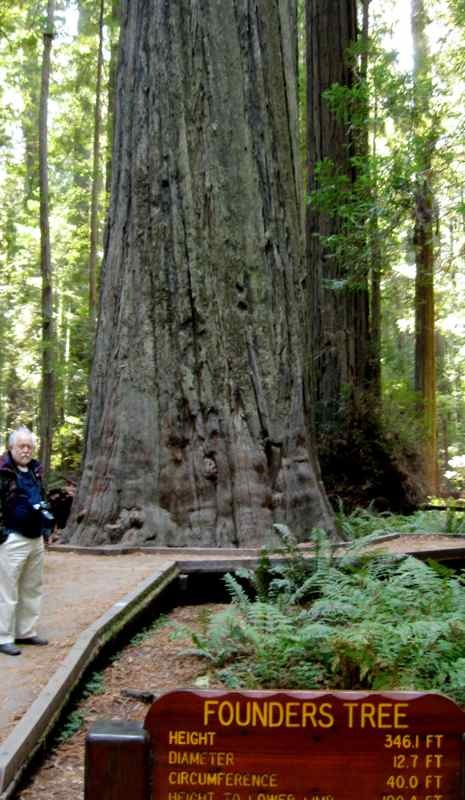 The first and northernmost grove we visited was in Jedediah Smith Redwoods State Park. Our drive through was a bit surreal. All low-to-the-ground foliage and the base of the trees close to the gravel road wore a coat of pale gray from dust stirred by traffic on the unpaved drive, a former stagecoach road. 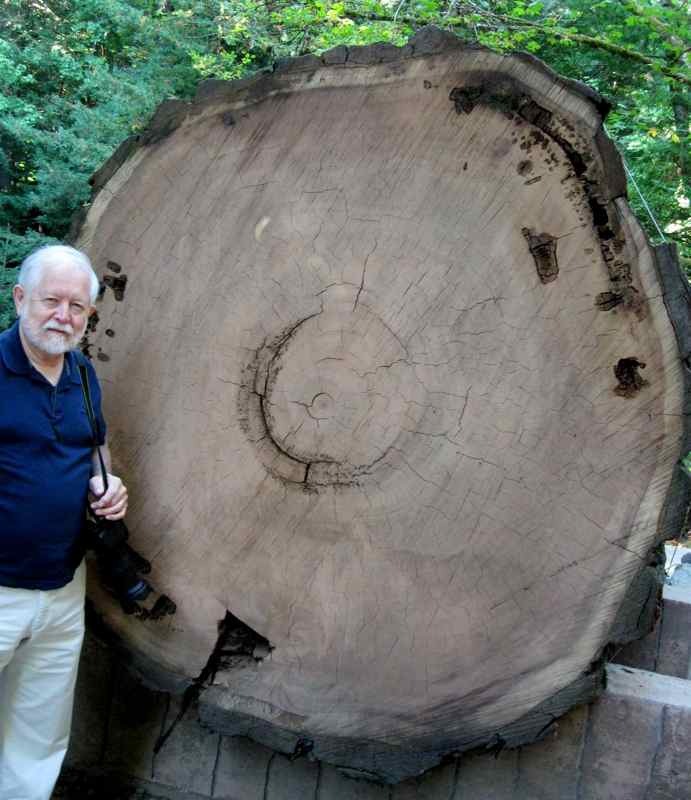 At a visitors center in Humbolt Redwoods State Park, I fulfilled the role of typical tourist and badgered my longsuffering spouse into posing with a redwood cross section. A walk through Founders Grove in Humbolt Redwoods State Park the next day was a chance to experience the natural wonderland of giant trees. My balance was more wobbly than usual. The result was out-of-focus and poorly composed photos. But the two below will spark my memory of an enjoyable walk. The first recommended itself to me because the dimensions were listed and the trail in front of it was level. The second was a survivor. Hollowed out by a lightening strike, it continues to grow. I do have a fascination for survivors. Husband Walter chronicled more details and images of our redwoods experience here. absolutely amazing, have never seen these wonderful trees, so thanks for sharing them with us. Wow, Talk about bigger than life. Thanks for sharing your wonderful photos!! For an old gal, you sure get around. Kinda like the California girl the Beach Boys sang about. I've never seen those magnificent giants, but I hope to one day. They are awe inspiring, for sure. Love the pictures, bot yours and the hubs! I saw the giant redwoods on my way from San Francisco to Santa Cruz, where my uncle (the dentist) lived. Awesome! We have camped at these places. 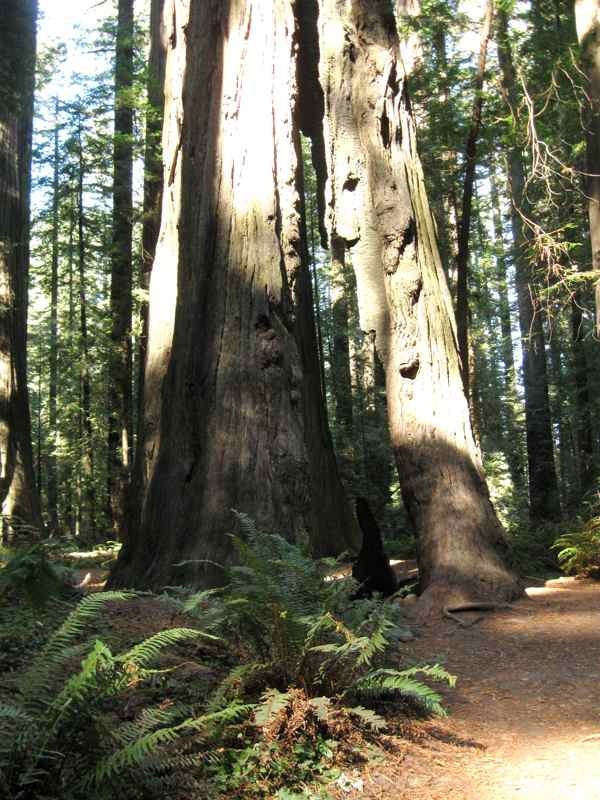 I just love the redwoods. I always feel like I am in a cathedral when walking through them. It feels like one should be reverant and quiet.